Is Canned Pumpkin Good for You? Pumpkin pie, cookies and cake are high-fat, high-sugar foods that contain canned pumpkin, but pure canned pumpkin is a low-calorie, nutrient-dense food. Eating canned pumpkin can help you meet recommendations to include at least 5.5 cups per week of red or orange vegetables in a 2,000-calorie-per-day diet. Low-calorie foods such as canned pumpkin can help you control your weight. A cup of canned pumpkin has only 83 calories. Substitute pumpkin for oil in baked goods to reduce their calories and fat. Blend pumpkin with white beans and spices as a lower-calorie alternative to cheese-based dips. Baked goods, such as pumpkin pie and cheesecake, can be high in calories, fat and sugar. A cup of canned pumpkin provides 7.1 grams of dietary fiber, or 28 percent of the daily value based on a 2,000-calorie diet. Dietary fiber can help you control your weight, but the average American consumes only half of recommended amounts. Thicken soups and stews with canned pumpkin instead of heavy cream to increase their fiber content. A cup of canned pumpkin also supplies 38,129 international units of vitamin A, or 762 percent of the daily value. Vitamin A support visual health. 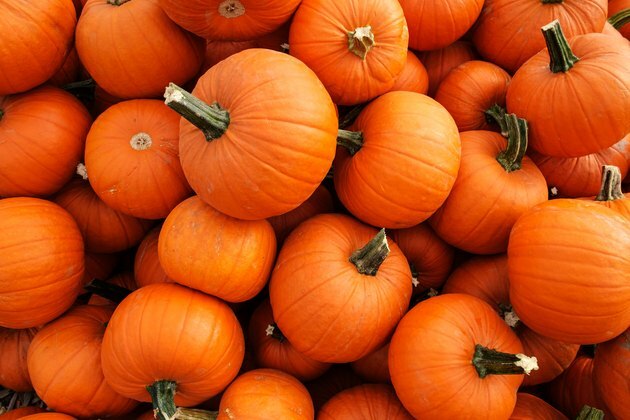 Pumpkin contains iron and vitamin E.
Canned pumpkin can be part of a healthy diet to control blood pressure because each cup contains 505 milligrams of potassium and only 12 milligrams of sodium. A high-potassium, low-sodium diet can help prevent high blood pressure, and healthy adults should get at least 4,700 milligrams of potassium and no more than 2,300 milligrams of sodium per day, according to the Dietary Guidelines for Americans 2010. Choose plain canned pumpkin since a cup of canned pumpkin puree with salt contains 590 milligrams of sodium. Pure canned pumpkin is distinct from canned pumpkin pie mix, which is a less healthy product because of its high sugar content. A cup of canned pumpkin pie mix contains 71 grams carbohydrates, with many of them from added sugars, while a cup of pure canned pumpkin has 20 grams of total carbohydrates and no added sugars. Each cup of canned pumpkin pie mix contains 281 calories.